Within a short journey from the city of Amsterdam there are countless places of interest, including historical landmarks and buildings and many immaculate landscaped gardens. There are also special excursions during tulip time. Other tours include visits to cheese factories, clog factories, windmills, Delft pottery, and traditional villages. There are many half- and full-day tours to these areas. Most cities are within a two-and-a-half-hour train journey of Amsterdam. The former Haarlemmermeer Station houses this interesting museum where historic trams run to Amstelveen providing an exciting outing for all the family, with a trip that takes just over an hour. This is a most beautiful and elegant royal palace. Built in 1692, the palace, with its pomp and splendour, was the summer residence of the Dutch royal family until 1975. Becoming a museum in 1984, the palace still boasts spectacular landscaped gardens, which are typical of a formal garden of the 17th century. Visitors can gain an insight into the lifestyles of the Dutch royal family over three centuries. A collection of royal carriages, vintage court cars and hunting carriages are on display in the stables. Helene Kröller-Müller began collecting modern art in 1908 and in 1935 donated her entire collection to the state. This museum now boasts a large collection of modern art, including an extensive collection of drawings, paintings and prints by Vincent Van Gogh, together with works by other great artists such as Pablo Picasso, Georges Seurat, Piet Mondriaan, Manet, Matisse, and Fernand Léger. The museum is also famous for the Beeldenpark, a unique sculpture garden which boasts works by such great sculptors as Rodin and Henry Moore. During the tulip season there are excursions to the Keukenhof, which is in the heart of the Dutch flower-growing area, between Haarlem and Leiden, where visitors are greeted with the intoxicating aromas and vivid colours of vast gardens containing millions of flowering bulbs, spread over a 28-hectare / 69-acre site. Although daffodils, hyacinths and tulips predominate, there are also many rhododendrons, flowering cherry trees and azaleas. Located close to Lisse in a wooded park, the Keukenhof is one of the most spectacular gardens in the world. The Zuiderzee was originally a bay in the North Sea. In 1932 its name was changed to IJselmeer after it was enclosed by the Afsluitdijkdijk. The Zuiderzeemuseum is located at Enkhuizen, about 65 kilometres / 40 miles north-east of Amsterdam. This open-air museum complex has permanent exhibitions and even historic sailing ships and features the culture of the surrounding area. The theme of the museum is the eternal struggle against the sea. Delft is one of the prettiest towns in The Netherlands with its 17th-century buildings and tree-lined canals. Perhaps most famous for its distinctive blue-and-white pottery, Delft is home to the country's largest technical university. Tours of the local pottery factories are available and these offer their products at very reasonable prices. Situated in the Polder area adjoining the Ijselmeer, this scenic little town is famous throughout the world for its distinctive red- and yellow-skinned cheeses. Founded in the 12th century, the town boasts many historic buildings and the stained-glass windows of the Grote Kerk are amongst the finest in The Netherlands. The Edam Museum is located in a 16th-century merchant's house. This delightful town is famous for one of The Netherlands' best-known exports, Gouda cheese. There is a weekly cheese market held by the Weigh House, where visitors can watch the painted farm wagons deliver the cheeses. Although Amsterdam is the capital of The Netherlands, The Hague is the seat of government and is well worth a visit. The Hague is home to the Houses of Parliament, the International Court of Justice and the Peace Palace and three royal palaces. There are 22 museums, foremost of which is The Mauritshuis Museum, which is situated next door to the parliament buildings and where many of the paintings on view adorned the royal palace. 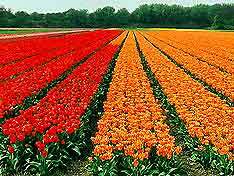 A 20-minute drive from Amsterdam, Haarlem is renowned for the growing and selling of flowering bulbs such as tulips, hyacinths, crocuses and narcissi which are exported worldwide. This fascinating mediaeval town is the capital of the North Province of The Netherlands. Many painters lived here in the 17th century, including Dutch master Frans Hals, and The Frans Hals Museum contains not just his works, but also great works by other eminent artists, with portraits, still life and landscapes. There is also a collection of modern and contemporary art. Haarlem is also home to The Teyler Museum, which is the oldest museum in The Netherlands. This museum features a great many paintings and hand drawings by Dutch masters, Michelangelo and Raphael. as well as a section on natural history. The port of Rotterdam is one of the largest in the world. During World War II the city centre was devasted by bombing but has since been virtually rebuilt and now features modern architecture boasting one of the country's leading universities, a number of interesting museums and a large zoo. Daily tours operate around the port area, where visitors can view container port shipyards and dry docks.